Extended access lists numbers are in ranges from 100 to 199 and from 2000 to 2699. You should always place extended ACLs as close to the source as possible. To better understand the usefulness of extended access lists, consider the following example. Here is another example of using extended access lists. 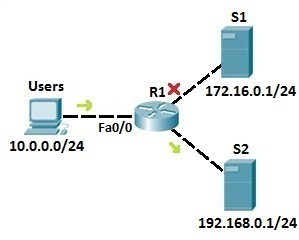 In this example we will use extended ACLs to filter traffic by the port used. Again, we have the Users network (10.0.0.0/24). On the right side, we have a server that serves as a web server, listening on port 80. We need to permit Users to access web sites on S1, but we also need to deny other type of access, for example the Telnet access. By using the TCP keyword, we can filter packets by source and destination ports. In the example above, we have permited traffic originating from the 10.0.0.0 network to the host 172.16.0.1 on the port 80. The last part of the statement, eq 80, specifies the destination port of 80. Since at the end of each access list there is an explicit deny all statement, the second ACL statement wasn’t really necessary. After applying an access list, every traffic not explicitly permited will be denied.